Hurry and get the Cottonelle Flushable Toddler Wipes for Kids, 6 Flip-Top Packs, 270 Fragrance-Free Wet Wipes in Disney Packaging, Mickey Mouse today for as low as $9.34 from Amazon when you choose Subscribe & Save with at least 5 subscriptions in one month. There are many variations at different prices! Quickly see them all here. Want it sooner? Choose one-time purchase & pay $10.99. 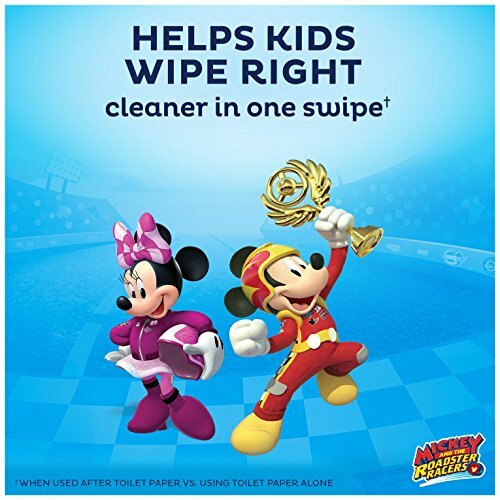 Helps Kids Wipe Right: Cottonelle Flushable Wipes help kids to do a good job cleaning up after using the toilet – all by themselves. Perfect to use as potty training wipes as well! With Cottonelle Flushable Wipes your kids can get clean all by themselves after using the toilet, to help avoid an itchy bottom. That’s because Cottonelle flushable wipes are soft enough to help prevent irritation yet durable enough to do the job. Best of all, the packaging has exciting Disney graphics of Mickey and the Roadster Racers. Great for kids who are just starting to train or already using the bathroom independently. These toddler wipes are fragrance-free, alcohol-free, hypoallergenic, and gentle on even the most sensitive skin. With just a little practice, your child will feel independent and you can rest assured they are clean. Unlike baby wipes, our toilet wipes have SafeFlush Technology – so they can be safely flushed. Trust the #1 flushable wipe brand to help kids wipe right. Buy the Cottonelle Flushable Toddler Wipes for Kids, 6 Flip-Top Packs, 270 Fragrance-Free Wet Wipes in Disney Packaging, Mickey Mouse from Amazon. Previous articleGarden Genie Gloves (with claws for digging & planting)!